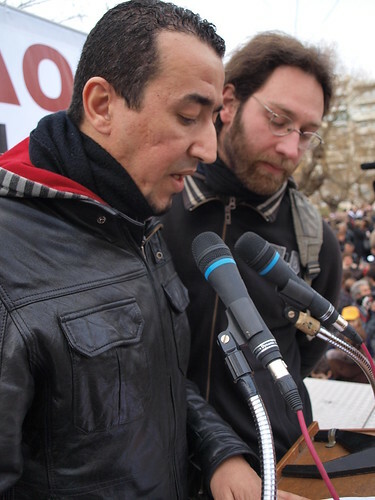 Spokesman for the 300 immigrant hunger strikers in Greece addresses rally. Spokesman for the immigrant hunger strike enters 35th day, originally uploaded by Teacher Dude's BBQ. Spokesman for the hunger strikers at a rally last wednesday. 300 immigrants in Athens and Thessaloniki have entered their 35th day of a hunger strike aimed at securing residence papers. From today onwards they will be refusing the sugar solution whicg they have been taking till now. With several hunger strikers hospitalised doctors have warned that they now risk the threat of permanent organ damage. Greece currently grants asylum to less than 0.1% of applicants and has been repeatedly condemned by the UNHCR, Amnesty International and the governments of Sweden, Germany, Holland and Norway for its treatment of immigrants. For more on the background to the situation check out these blogs (written in a variety of languages, including English). 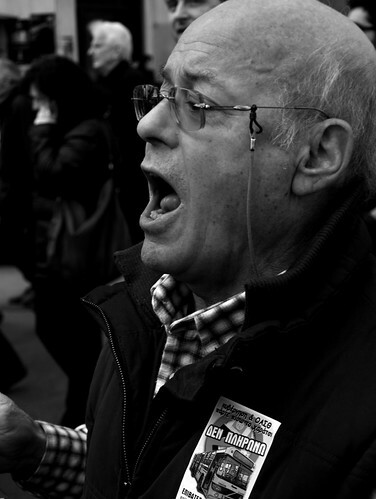 Photographs and video from Greek anti-government march on 23rd February 2011 - Thessaloniki. More pictures and video from the marches that accompanied the general strike last week. The person taking the video was also attacked by police officers who often employed batons and tear gas indiscriminately to break up the march. In addition to this the riot police also made extensive use of military grade ordinance which is intended for special forces anti-terrorist operations in the form of the N591 stun grenade. This is the third occasion (I've witnessed this in the last year alone. See here and here for the previous two instances). At 8 mins 20 sec you can see footage of the police attacking the camera operator as they tried to film the arrest of a demonstrator. I also saw uniformed officers clubbing marchers on Tsimiski Street who had not been involved in any acts of violence and clearly posed them no threat. The video was originally posted on the We Are Change Greece website which has a description of the events shown in Greek and English. 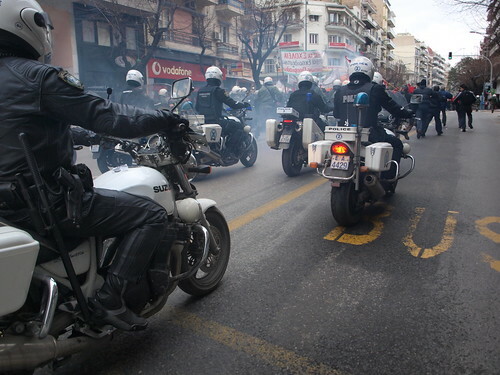 Another video from the Antipliroforisi (Anti-misinformation) site from the same demo showing police using tear gas, flash greandes and motorcycles to stampede demonstrators along the main street in Thessaloniki. Greek police use tear gas to break up anti-government march - Thessaloniki, Greece, originally uploaded by Teacher Dude's BBQ. Yesterday's general strike in Greece shut down much of the country's infrastructure and was accompanied by protests marches nationwide. In Athens organiser said that turnout was over 100,000 and in the northern port city of Thessaloniki between 15,000 and 20,000 too part in anti-austerity demonstrations. 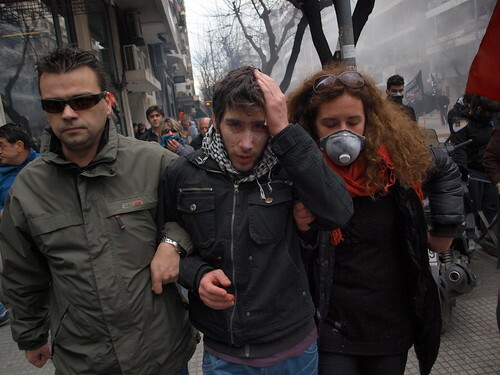 The police in Thessaloniki used tear gas, clubs, flash grenades to break up the march after anarchist groups started smashing windows and tearing down bank security cameras. However, the riot units concentrated their attention on leftist groups not involved in acts of vandalism, attacking trade unionists and members of left wing groups along the length of the central Tsimiski Boulevard.. The police also used motorcyle units to chase and intimidate marchers in scenes remininscent of the unrest that followed the re-election of Iranian President Mahmoud Ahmadinejad. Clashes continued later when groups attacked the Ano Poli police station when rocks and Molotov bombs. For more pictures check out my story on Demotix. Greek activists take over road tolls nationwide in protests over price hikes, originally uploaded by Teacher Dude's BBQ. For more information on the movement check out their blog. 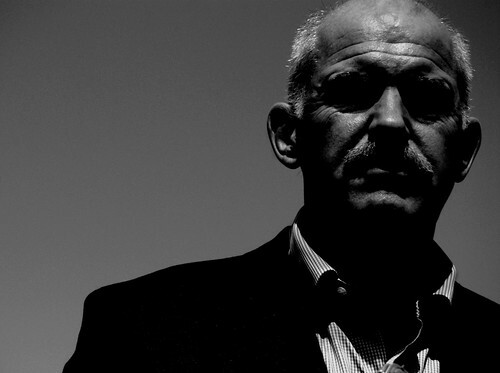 Papandreou's credibility gap widens at home. Today the Greek government started its plan to boost the local car market by encouraging motorists to take their old cars off the road in return for subsidies of up 6000 euros on the purchase of new vehicles. The plan is according to government designed to revive the country's ailing car market which has been hard hit by the current economic crisis. Although prime minister Giorgos Papandreou likes to give the appearance of being more ecologically minded than his predecessors the policy of promoting more car sales whilst making bus and tram use much more expensive is hardly the greenest way forward. However, such contradictions are emblematic of the ruling PASOK party's often schizophrenic policies. Last week junior minister for education Fofi Genimata announced that introduction of a new 2.2 billion euro package designed to promote life long learning yet at the same time lecturers in Greek polytechnics (TEI) were occupying campuses nationwide in protest over the fact that they have not been paid since November. Likewise angry parents demonstrated the decision by school bus drivers in Greece's second largest city, Thessaloniki to suspend work until they have been paid money owed . Time and time again the government announces new programmes or introduces legislation without checking whether the funds are available in the vain hope that such policies will, at least in the short term divert voters attention from the fact that the economy is in free fall and no one, least of all politicians have the slightest idea how to fix the problem . Whilst everyone agrees the answer to Greek woes is "development" the policies being promoted to encourage it are not working. Cuts in the public sector have reduced government spending but at the same time disrupted the national economy and lead to spiralling unemployment and the closure of hundreds of thousands of small businesses. Likewise falling wages are crippling Greek families who are also facing huge rises in costs of utility bills, transport and food. Even consumption of bread has been hit with bakers reporting drop in turn over of 30%. The most blatant contradiction between Papandreou's stated aims and the government's day to day running concerns political corruption. Although the country has been rocked by revelation after revelation over the bribes paid to government ministers and other high level officials belonging to both PASOK and its main rival New Democracy not one MP has been charged nor spent a day in jail. On the other hand when faced with a campaign of civil disobedience over increases in bus fares and road tolls legislation was quickly passed that make such actions criminal offences. It's hardly surprising given this background that the government faces an ever growing credibility gap with fewer and fewer people believing that those in charge have either the will or the ability to drag Greece out of its present slump. Back to the future for Greece. I suppose it is natural when faced with new and unsettling situations to turn to tried and tested solutions. This certainly seems to be the case with the Greek government who are in a historically retrospective frame of mind. Recently, the ruling PASOK party decided that the private sector would be better suited to the job of collecting tax, an idea almost as old as civilisation itself. In Ottoman times it was named Iltizam with the state auctioning off taxation rights to the highest bidder (any connection between and the current greek system of road tolls is purely coincidental). A similiar set up known as the Ferme Générale was also used to great effect by Louis XVI, well, at least until outraged tax payers helped liberate the Sun King's head from the rest of his body during the French Revolution. Also dating from this period the Greek government headed by the son of a political refugee and immigrant is in the process of restoring the18th century prison hulk for immigrants entering the country via Turkey. Αccording to the Vima newspaper 300,000 euros per year will be spent on renting a Dutch owned prison ship which will be anchored off the coast near the northern city of Alexandroupoli. The fact that such a vessel can be towed out to sea means that it is far away from such interfering busy bodies as the UNHCR and Amnesty International who have regularly condemned the conditions under which immigrants in detention are held. As with the idea of privatised tax collection the prison ship has a long and glorious history which does it credit. Just ask the Nazis and Chile's Pinochet regime who made use of this wonderful innovation. Add a touch of malnutritian and a case or two of scurvy and the glory days of the 1800's are once again yours. 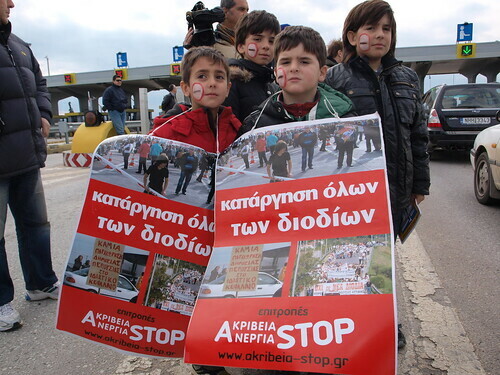 Those of a more modern turn of mind might be able to see similarities between Athens handling of public protests over the building of a landfill site in the Keratea region near Athens and those that followed the Japanese government's attempts to extend the Narita airport from the late 60's till the 70's. In both cases the government believed that the best way to promote devlopment was through the liberal apllication of riot police, tear gas and violence. In this case Giorgos Papandreou is no slouch and has employed the quasi - military MAT special police units with an elan that would make his fellow members (well, till last month) of the Socialist International Hosni Mubarak and Ben Ali green with envy. Like the Narita example, villagers and local inhabitants of towns in the area have been fighting long and bitter battles with the authorities for other 70 days. While the government insists that the rubbish dump is necessary for the future of waste deposal in the capital the type of facilities it is promoting is due to be phased out in the EU within two years according a blog written by residents. The reality of the situation is the current administration is clutching at straws, left staggering from a series of politically damaging gaffes and losing supporter at an ever increasing rate the PASOK leadership is desperately attempting to claw its way out of the hole which it has dug for itself by promoting even the most improbable of policies in the hope that voters will be convinced that it is doing something positive for the country. On Friday the IMF, EU and ECB (known locally as the Troika) announced their joint proposals concerning the future of the Greek economy and actions needed to reduce the country's massive debt load which is set to exceed 150% of GDP this year. The most controversial element of the plan is the privatisation of 50 billion euros of public assets over the next three years and was protrayed in much of the media as a sell off of the family silver at bargain basement prices. Only the rabidly pro-PASOK Ethnos newspaper dared to present the news that troika representatives had issued an apology as a victory for the government. In the face of such stiff opposition Greek Prime minister Giorgos Papandreou claimed to have blind sided by the EU-IMF saying that the press conference had given the impression that the Greek government was simply following the orders given it by the country's creditors.The reality of the situation is that the so-called argument is a rather crude PR trick designed to spin the fact that the ruling PASOK party have already agreed to carry out the measures demanded and is attempting to sell the public the idea that they are still in charge and not just acting as locally recruited management representatives. The ploy has failed to convince even ardent government media supporters in the privately run SKAI channel who condemned it as a cheap theatrics. Indeed it is hard to believe that after months of negotiations the head of the Greek government was unaware of all the details of the EU-IMF strategy and was taken by surprise. Actually, if you read Papandreou's actual complaint he was apparently not criticising the content of the Troika's press conference but the manner in which it was presented. Government minister for education Anna Diamantopoulou even went as far as to suggest that Troika representatives be banned from making public statements during a radio interview this morning. Many Greek journalists and commentators have derided the plan to raise the 50 billion as impractical given the depressed state of the economy and the Greek state's abysmal record in selling off public assets. For example more than seven years after hosting the Olympic games in 2004 much of the expensive facilities built are falling apart, forgotten and neglected despite the billion dollar price tag. Another fear is that given the deeply corrupt nature of Greek politics much of the assets will be sold off in sweet heart deals to friends and supporters of the government and so the sacrifices made by the Greek people will be wasted as little of the money will actually make it into public offers. These concerns are no just limited to a few crackpots but are daily reinforced as scandal after scandal involving officials from both of the largest political parties are swept under the carpet. Only last week charges against those involved in the massive Vatopedi monastery land swap scandal were dropped despite the fact that the case resulted in the Greek state losing hundreds of millions in lost revenue.Likewise revelations in Der Spiegel last year that members of the ruling PASOK party including an ex - minister of defence took bribes in return for buying German submarines have resulted in no official reaction of behalf of the country's justice system. Given the inability of the political system to police itself the idea of politicians handling billions of dollars in real estate and public property is an invitation to corruption on a scale not seen since the debacle that followed the fall of the Soviet Union when massive fortunes were made by ruthless “businessmen” who used bribes and threats to amass fortunes by taking control of state owned industries. Civil disobedience in Greece's second largest city, originally uploaded by Teacher Dude's BBQ. Members of the "We Won't Pay" campaign take over buses in Thessaloniki, Greece in protests over the latest round of bus fare increases which have pushed up ticket prices by up to 180%. The PASOK minister for transport, Demtrios Reppas responded by calling those taking part "freeloaders" while the government hastily passed legislation making failure to pay bus tickets a criminal offence.It is ironic that Reppas who has, as a member of Greek parliament since 1981 been entitled to free travel for three decades is now accusing those who refuse to pay fare and toll price hikes of ranging from 40% to 300% of being unreasonable. For more on the aims and actions of the organisation (in Greek but tyou can use Google Translate). Employees of the Agelioforos and Makedonia newspapers protest wage cuts in Thessaloniki, Greece, originally uploaded by Teacher Dude's BBQ. Management of the newspapers are attempting to reduce pay by between 25 and 40%. 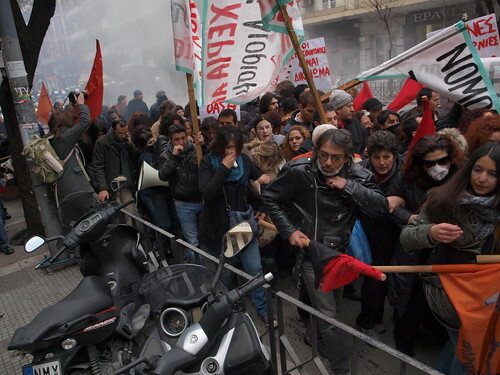 In protests employees marched through the centre of Thessaloniki, Greece's second largest city yesterday morning. The newspaper industry in Greece is, like so many other places in crisis with falling sales and an uncertain future. However, unlike other countries the main problem is not so much competition from the internet as with falling advertising revenues caused by a shrinking economy. On the other the quality of journalism in many papers is poor and people are less and less willing to pay for reporting that is often little more than rehashed party political PR and overly reverential interviews with those in power. The media in general is viewed by many as being unreliable and beholden to powerful political and business interests (see here for survey carried out by GPO) . Less the fourth estate than the propaganda wing of the PASOK and New Democracy parties along with those businessmen who support them. 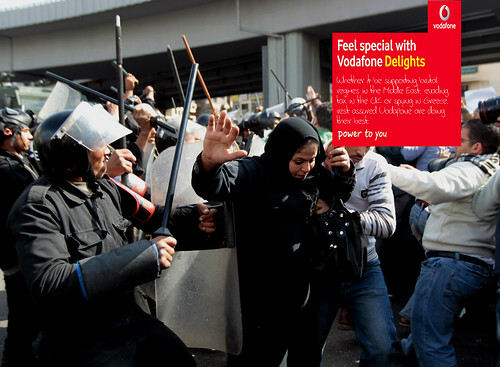 Vodafone - Welcome to Egypt, originally uploaded by Teacher Dude's BBQ. I've just changed my mobile phone service, finally. 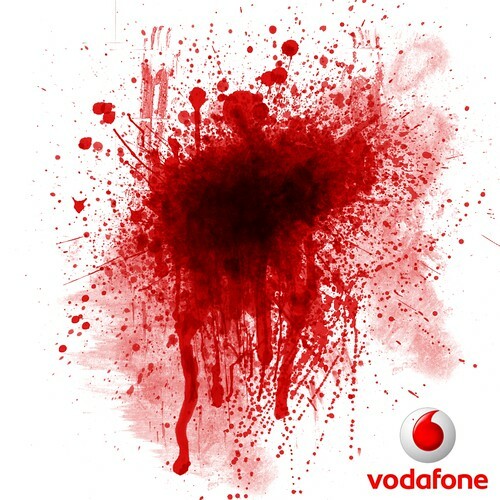 The final straw for me was Vodafone's shameless support of the Mubarak regime and the way in which they allowed their network to be used to incite violence against those Egyptians who wish their country to have a more democratic government. It wasn't just that, of course the massive tax evasion by Vodafone in the UK, phone tapping scandals in Greece and the fact that that the company offers a poor service at exorbitant prices proved to be a fatal combination. Is Greece the next Egypt? 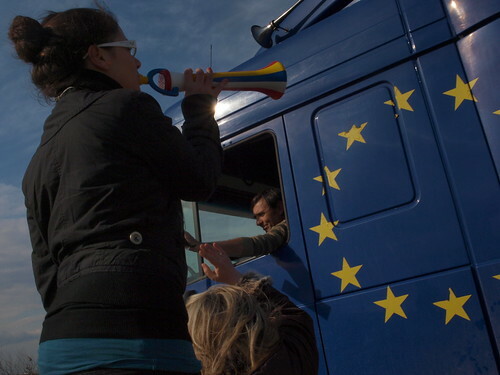 It seems that Greek farmers are getting ready to protest following the break down of talks with the government. If this does take place then they will become yet another group that has decided that the only way Athens will listen to their demands is to take action and in the case of the farmers this usually means blocking highways. More and more employees are refusing to buckle down and accept the bitter medicine prescribed by the IMF, European Central Bank and the EU. Doctors are currently on strike and have been occupying the Ministry Of Health offices, public transport employees in Athens are continuing their strikes, teachers and chemists are also following the same route. Whilst the protest movement against massive price hikes in road tolls and bus ticket prices grows ever stronger and despite villification in the mainstream press remain popular. On the other hand the ruling PASOK party has been reduced to fighting this growing tide of civil disobedience with a mixture of police crackdowns and slurs which are dutifully repeated and amplified by pro - government TV stations in their news bulletins. The reality, however, is that support for Giorgos Papandreou is at an all time low and the loathing that ordinary Greeks feel for their politicans is so intense that PASOK cabinet members travel only under conditions of strictest security whereby itineries are often not announced till the last minute and public apperances are almost impossible unless those present are carefully vetted. 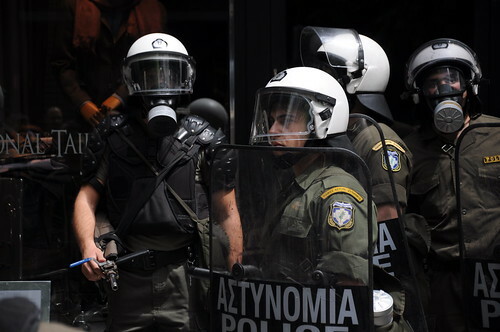 Even then they are accompanied by hundreds of the quasi - military riot squad, known as the MAT in Greek. While both PASOK and New Democracy parties have once more swept the Siemens and Vatpoedi corruption scandals under the carpet they insist that many of the protests are illegal and that the law should be applied. One can't be helpthink that if that were the case a large portion of Parliament would either be in prison or in exile with Tunisia's Ben Ali. There is such a huge disconnect between rulers and ruled in Greece that I wouldn't rule out Egyptian style mass demonstrations before the year is out. In both cases corruption, nepotism and incompetence can no longer be tolerated by people whose living standards are being depressed by those who live in the lap of luxury. It is a bitter irony that Greek MPs whose income is often more than 10,000 euros a month are demanding those who do not earn that in a year make sacrifices in the name of competiveness.How long this massive inequalities can be sustained is a matter of debate and given the intense feeling of anger and disappointment it is very hard not to see Greece as parched forest in which just one spark will set off a wildfire which will quickly rage out of control..
Hosni, don't forget to write. Hosni, don't forget to write., originally uploaded by Teacher Dude's BBQ. 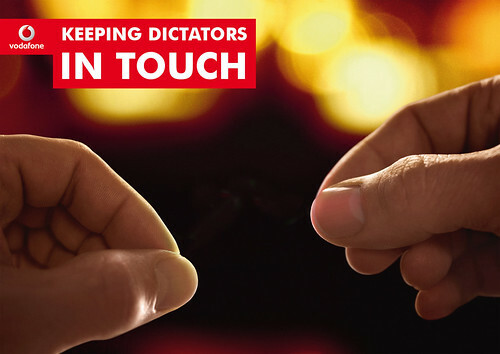 Vodafone: Keeping dictators in touch, originally uploaded by Teacher Dude's BBQ. 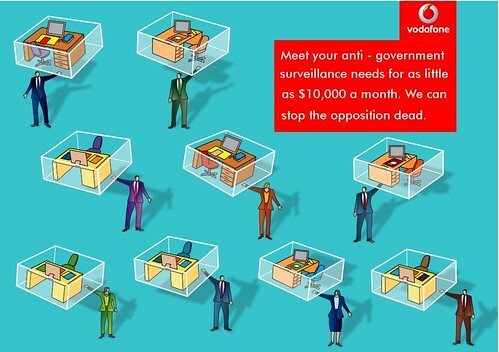 "In a press statement, international mobile operator Vodafone said that Egyptian authorities have ordered the network to send pro-government messages. “Under the emergency powers provisions of the Telecoms Act, Egyptian authorities can instruct the mobile networks of Mobinil, Etisalat and Vodafone to send messages to the people of Egypt,” read the message posted on Vodafone’s website on 3 February." 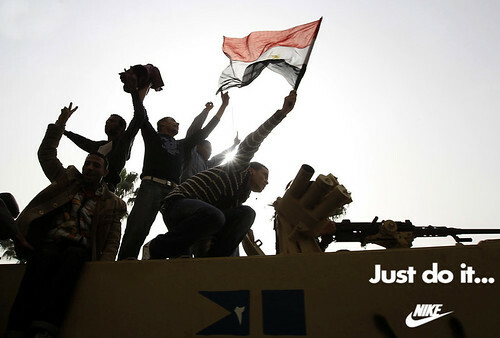 Regime change in Egypt - Just do it. 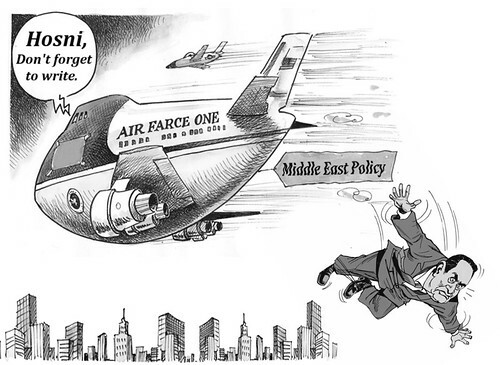 Regime change in Egypt - Just do it., originally uploaded by Teacher Dude's BBQ. 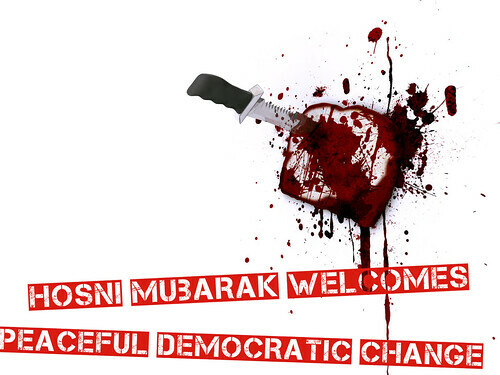 Hosni Mubarak welcomes peaceful democratic change, originally uploaded by Teacher Dude's BBQ. Over the last 24 hours I have been following the tragic events in Cairo and other Egyptian cities as ordinary people try to rid themselves of a truely corrupt and violent regime which has ground them into the dirt for decades. Yet despite endless abuses by Mubarak and others in the government the USA still finances them to the tune of nearly $2 billion per annum ($1.3 billion going to the military), making Egypt the second largest recipient of American foreign aid. 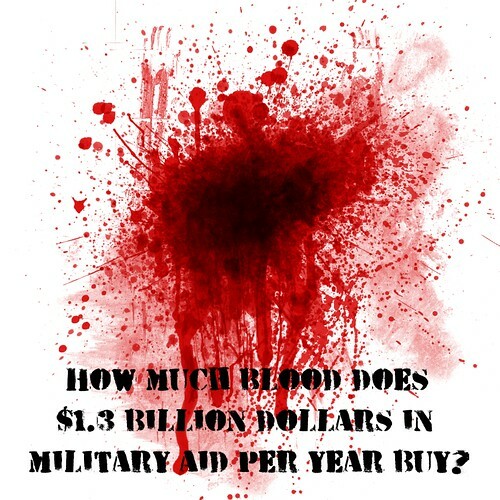 Just how much blood do such large amounts get you? For live coverage check out Al Jazeera here or on Youtube. Also for more updates check out the #Egypt and #jan25 hash tags on Twitter. 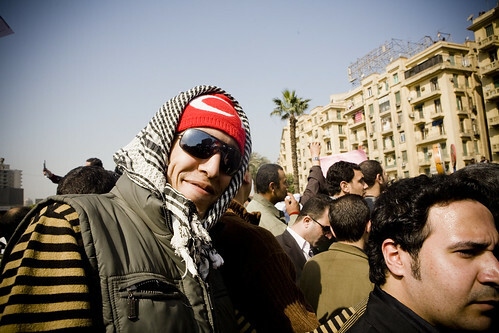 IMG_6683, originally uploaded by 3arabawy - صَحـَـفي مِصـْـري. 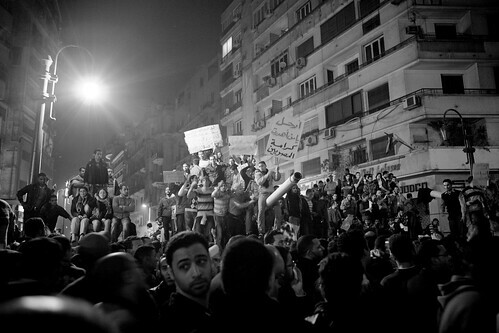 Photographs of the protests in Cairo by photographer, blogger and journalist Hossam el-Hamalawy. For more pictures click here to see his Flickr page.